The Beatles Song of the Day is Two of Us. Two Of Us is on The Beatles Let It Be album and was written by Paul McCartney. Paul has said the song was written about the adventures he and his new wife Linda were having. I have always suspected there was at least some of the song inspired by his friendship with John Lennon. The original title of the song was “On Our Way Home.” One of my favorite album cuts from Let It Be. 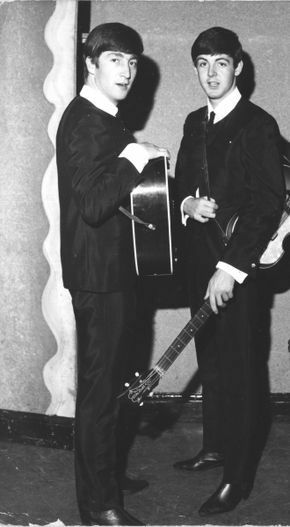 Great to hear John and Paul singing together like the early years. Paul McCartney: vocal, acoustic guitar: John Lennon: vocal, acoustic guitar: George Harrison; lead guitar: Ringo Starr: drums. Produced by Phil Spector. Rating of Two of Us- **** 1/2 stars out of 5. Two Of Us was never released as a single. Recorded on : January 24,25, 31, 1969.
critic Bill Wyman ranks Two of Us- #111 out of 213 Beatles songs, Jim Beviglia ranks it at #41, The Beatles Channel Listeners Poll #47, Rolling Stone has it at #54. Spignesi and Lewis did not have it in their Top 100. It should have been a single…to me anyway. I agree- would have been a hit. Always has been a classic Beatles cut.